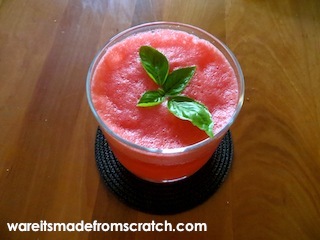 In a blender, combine watermelon and lemon juice. Blend. Add ice cubes and blend a little more. Pour into glasses. If desired, add 1-2 tablespoons of seltzer into each glass for a sparkling drink. Top each glass with a sprig of basil.